If you want to point your finger at a company that has bought back lots of stock with little effect, look at these six companies instead of Apple. Can we still call it a "hot take" when some financial pundit takes a swipe at Apple (NASDAQ:AAPL) for its massive stock buyback program? If you follow any financial talking heads on Twitter, you may have noticed that any percentage-point dip is a chance for them to say something about the tech giant's wasting shareholder capital or not being able to time the market. For all the criticism that Apple gets flung its way for buying back loads of shares, at least those buybacks are doing what they are designed to do: lower share count. The same can't be said for every company with multibillion-dollar stock buyback programs. Some of the biggest and most profitable companies in America have spent tens of billions of dollars over the years on share repurchases, but they have little to show for it. Over the past 20 years, Procter & Gamble has spent $96 billion on its share repurchase programs. When you consider that the amount is a significant portion of the company's $230 billion market capitalization, you would think that $96 billion would buy a decent amount of shares over such a long time horizon. During that time, though, the company's share count has decreased by less than 4%. The biggest difference between the efficacy of Apple's and Procter & Gamble's stock repurchase programs has a lot to do with their stock compensation programs. In the time that Apple has deployed that $127 billion on share repurchases, it has issued about $2 billion worth of stock for employee stock options. Procter & Gamble, on the other hand, has issued more than $20 billion worth of exercised stock options during that time, as well as another $6 billion in stock-based compensation. Keep in mind, too, that exercised stock options on a cash flow statement do not account for the full value of that stock, so the total share impact of those options is much greater than what the company's cash flows indicate. It's pretty safe to say that, to an individual investor in Procter & Gamble, the $96 billion in share repurchases has not been of a huge benefit. Much of that benefit has been taken back by stock-based compensation to the company's employees. I don't mean to suggest Procter & Gamble is the sole company spending large amounts on stock compensation relative to the amount spent on share repurchases, because it is much more common than you might think. Here is a list of companies that have spent staggering amounts of money on share repurchase programs in relation to their market caps, but at the same time have issued large sums of shares through exercising stock options that have led to rather paltry share-count reductions. Data source: S&P Global Market Intelligence. All results in millions. Another thing I should also be clear about is that issuing stock options isn't the only reason for tepid share-count reductions or, in some cases, increases. Many of these companies have used their own stock as currency in major acquisitions, such as Procter & Gamble's $54 billion deal for Gillette in 2005, Cisco's $6.9 billion deal for Cerent in 1999, and Wells Fargo's $15 billion purchase of Wachovia in 2008. Overall, though, larger chunks of these companies' buyback programs have been eaten up by issuing of stock options compared to what Apple has done over the past four years. This isn't to say that any of the companies that have spent billions on share repurchase programs with little in share-count reduction to show for it are bad investments. 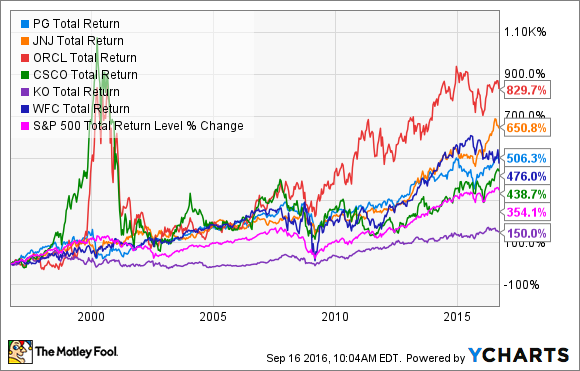 On the contrary, over a 20-year time frame, all of the companies listed here, with the exception of Coca-Cola, have outpaced the S&P 500 on a total-return basis. So clearly these companies are doing something right, and the impact of their share repurchases and issuances on performance has been marginal. The bigger message here is that the critics who give Apple flack for its buyback program overlook those companies with buyback programs that have had little effect over the long term. So far, Apple is onto something with its share buyback program. As long as it doesn't fall into the trap of shelling out generously on stock option programs that erode share-count reductions, then long-term investors won't be complaining much about the company's buying back stock.